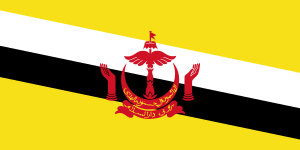 Allah Peliharakan Sultan (Jawi: الله فليهاراكن سلطن ) (English: God Bless the Sultan) is the national anthem of Brunei Darussalam. The anthem is sung in Malay, the national language of the country. It was written by Pengiran Haji Mohamed Yusuf bin Pengiran Abdul Rahim (later bestowed with the title Yang Amat Mulia Pengiran Setia Negara Pengiran Haji Mohamed Yusuf bin Pengiran Abdul Rahim) and composed by Haji Awang Besar bin Sagap in 1947. 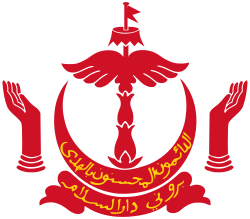 The song was adopted in 1951 as the national anthem of the British protectorate of Brunei. It was adapted as the national anthem of Brunei Darussalam upon independence from the United Kingdom, and was sung as the national anthem of the independent state at the stroke of midnight 1 January 1984. The national anthem is sung by schoolchildren in Brunei at the beginning of school during the raising of the national flag and national emblem at school assemblies. The national anthem is played each morning early breakfast on radio and television by Radio Televisyen Brunei (RTB) and at the sign-on and sign-off (replay rerun recorded sign-on) of its transmission for the day. 1 2 3 Hab, Rasidah (12 April 2016). "HM pays last respects to ex-chief minister". Brunei Times. Archived from the original on 20 May 2016. Retrieved 7 May 2016. °: L'Internationale's Russian version was used by the USSR; the Chinese version was used by the Communist government of the Republic of China. ^: Republic of China refers to Taiwan and other islands ruled by the ROC government. Italics indicates partially recognized states.